As panic turned to anger following the last front line clash between Armenian and Azerbaijani forces on the line of contact in Nagorno Karabakh, more deaths reported in July rocked the nation. This time, however, Armenian soldiers were not killed by Azerbaijani forces, but apparently by their fellow countrymen. The first incident in which an army officer was discovered dead at an outpost on Armenia's border with Azerbaijan was shocking enough. The Ministry of Defense says that Lieutenant Artak Nazaryan, a 30-year-old contract serviceman, committed suicide, an account his family strongly rejects. Instead, they say, his death was the result of hazing in the military. According to his family, Nazaryan's body bore injuries all over and were made just hours before he allegedly shot himself. “He believed in God and knew that suicide is a great sin,” his mother told Radio Free Europe. “If it was a suicide, just imagine how much suffering and humiliation he endured before resorting to that,” his sister added. But although Nazaryan's relatives doubt that any investigation will be conducted properly, its announcement followed an even more dramatic and unexpected incident in Nagorno Karabakh when six soldiers were killed in a shooting spree on the front line. According to a human rights activist, Artur Sakunts, an Armenian soldier was responsible. Sakunts further reported that after finding him asleep at his post, an officer and sergeant humiliated a young conscript. It was then that another conscript, Karo Ayvazyan, shot both of them dead as well as three other soldiers who rushed to the scene before committing suicide himself. The incident reportedly happened just one day after Nazaryan's death. Although conditions in the Armenian military have improved since the early 1990s, hazing still remains a serious issue and non-combat deaths are still a concern. Two years ago, the U.S. State Department reported that it believed most investigations into such incidents were not conducted correctly, and also involved tampering with evidence. On his part, however, Armenian Defense Minister Seyran Ohanyan assured the media and relatives of the dead soldiers that both cases would be solved. He also reminded them that the number of incidents had significantly been reduced since the 1990s. Nevertheless, 18 soldiers died during military service in 2009 in non-combat related circumstances. In fact, critics argue, the latest incidents highlight serious problems in a military plagued by corruption and human right abuses. Indeed, bribes to avoid conscription or to serve in more convenient locations are commonplace. This reality was highlighted by the second incident involving Ayvazyan. The 21-year-old, the Armenian media later reported, had a history of mental instability and had a criminal record in the United States, including for robbery and illegal arms possession, for which he was deported back to Armenia last year. He also reportedly spent time at a psychiatric clinic in California. Ayvazyan's uncle says that under such circumstances, his nephew was unfit for military service, but alleges that exemption also carried with it the need to pay a $4,000 bribe. The Ministry of Defense, however, refutes such claims and says that he was conscripted because no documents detailing his convictions or mental state were produced. 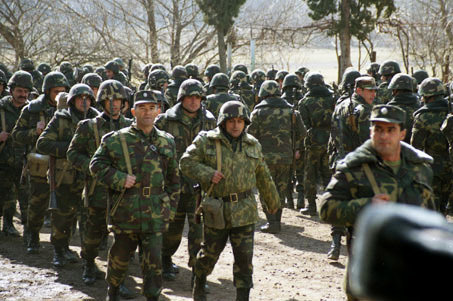 Regardless, the two incidents were enough to cause an uproar, with the extra-parliamentary opposition led by former President Levon Ter-Petrosyan calling it the result of an “unhealthy atmosphere and criminal practices reigning in the army.” The same claims were also made by an Armenian serviceman, Karen Harutyunyan, who crossed into Azerbaijan last month. The incidents also confirm the presence of Amenian soldiers in Nagorno Karabakh, something official Yerevan denies, but which most citizens know. Indeed, bribes are often paid to avoid service on the front line. "It's usually the rich who do their army service in Armenia while the poor are sent to Karabakh,” Harutyunyan told Azerbaijani media. Three other Armenian conscripts who also crossed into Azerbaijan earlier this year also held similar interviews. The Armenian Ministry of Defense, however, counters that such interviews run counter to the Geneva Convention and accuses Azerbaijan of propaganda. Moreover, the government denies accusations that the military has worsened since the times when Ter-Petrosyan was in power and insists it is still the most combat ready in the region. Yet, the severity of two incidents happening so closely together has shocked many. Indeed, in the second week of August, 8 officers were dismissed, 13 demoted, and 20 reprimanded.